Eccie the Trekkie | Warped Factor - Words in the Key of Geek. If for whatever reason you're acquainted with Star Trek but have managed to thus far avoid all the fuss over Doctor Who & now want in, help may be at hand! While it might initially have been perfectly understandable that you'd prefer one over the other, why not step over the threshold & into the TARDIS with a man who has experience of appearing in one while being a fan of the other? 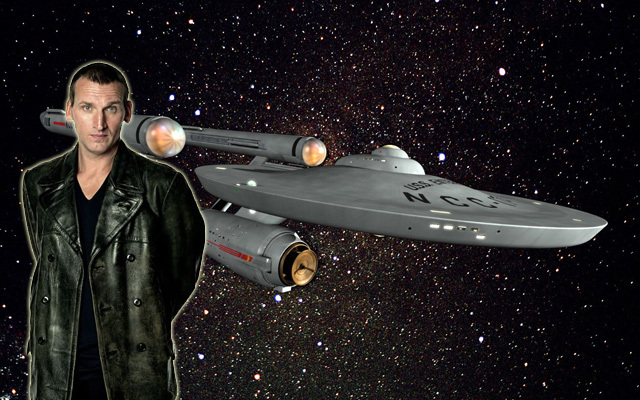 For Christopher Eccleston, aka the Ninth Doctor, is just that chap. "Pragmatic, witty, brave, intelligent, anarchic, heroic and caring--he cares about life in all its forms, and has a permanent sense of wonder at the world and everything in it. He's also childlike, contradictory, brutal to his enemies, and constantly restless and inquisitive." That's how he characterised his take on the first New-Who incarnation of the Doctor, much like Captain Kirk, you might think? Signing on to appear in that first series of the rebooted programme before making an exit after just thirteen episodes, the first Northerner to take the key to the greatest of police boxes would later out himself as more of a connoisseur of the comings & goings of the Starship Enterprise! Talking to the Radio Times, he would reveal that he always found Trek more real, presumably preferring the maverick captain of that great vessel to the many-faceted Time Lord at least as he remembered the incarnations he watched growing up. "I was fascinated by the idea of someone being the same person on the inside, but suddenly looking different on the outside. With Doctor Who, though, I have to say that the low production values prevented me from believing it was real--unlike, say, Star Trek. I also felt the Doctors came across as these authority figures, lecturing me in their upper-middle-class accents." And as he said while being interviewed for Metro ahead of the release of Thor: The Dark World. "As a kid, I hated Star Wars but I loved Star Trek. And I’ve since realised the reason I love Star Trek is because it is entirely about character. You have villains and some space but it’s basically a brilliantly written love triangle between Kirk, Spock and Bones – Lieutenant Uhura being the “beard” from what I could see." JACK: Good evening. Hope we're not interrupting. Jack Harkness. I've been hearing all about you on the way over. ROSE: He knows. I had to tell him about us being Time Agents. 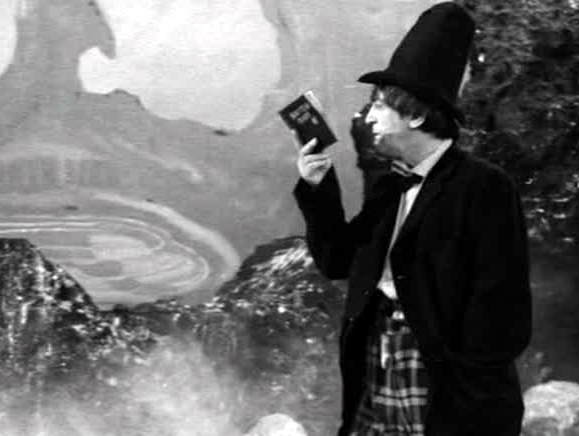 An obvious nod to that most logical of Vulcans - Vulcan also being the name of the planet the Doctor visited immediately following his first regeneration in The Power Of The Daleks by a quirk of imagination. Back now to the man he would become, & the technology finding itself in wartime London courtesy of the rogue Time Agent. DOCTOR: Sub-atomic robots. There's millions of them in here, see? Burned my hand on the console when we landed. All better now. They activate when the bulk head's sealed. Check you out for damage, fix any physical flaws. Take us to the crash site. I need to see your space junk. ...Indeed, they were originally also given the same name before this was changed to avoid confusion at the suggestion of script editor Helen Raynor. Travelling a little further back down the Doctor's timeline, Spock's Brain & the Tom Baker/ Fourth Doctor story The Invisible Enemy also share a vague similarity in that both feature alien intelligences attempting to make off with the considerable brains of their protagonists! LEELA: Are you all right? DOCTOR: Rightly perfect, thank you yet, Lalee. DOCTOR: I said, I'm perfectly all right, thank you, Lalee. LEELA: My name is Leela. DOCTOR: Hmm? I know your name. Leela. DOCTOR: Must have had a bot of a shik. DOCTOR: A bot of a shik. LEELA: Doctor, what is it? What's the matter? DOCTOR: There's a voice or something in my head. Though perhaps there's more of a kinship between robot dog K-9, who comes aboard the TARDIS at the conclusion of the trip into the Doctor's noggin, and the man from Vulcan. Both of them are coldly logical with no obvious emotional attachment to those they assist while still seeing them as friends of sorts. Barring of course Spock's bout of pon farr frustration! We might conclude that it is indeed only logical! Live long, thousands of years long in the case of the man from Gallifrey, and prosper!